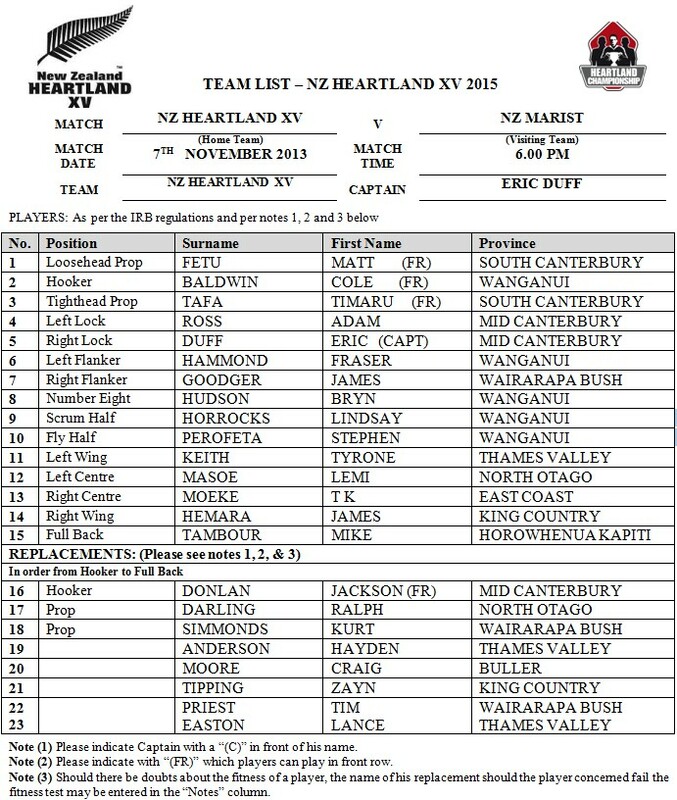 The following players have been selected for the NZ Heartland XV to play against the NZ Marist XV on Saturday 7th November, 2015 @ TrustHouse Memorial Park , Masterton. Craig Moore is named on the bench for the Heartland side this Saturday. Heartland XV Head Coach Grant Keenan said the squad had trained well this week and they were excited to get their campaign under way. Mid-Canterbury’s Jon Dampney has been called into the squad as cover after resident captain Peter Rowe was suspended for one match for foul play in Wanganui’s Meads Cup Final against South Canterbury. “We’re obviously disappointed to have lost Peter, but we have full faith in the entire squad. Eric captains his Southern rugby Club in Mid Canterbury so he will be no stranger to leadership on the field. “Everyone is excited – there’s great energy and enthusiasm in the camp. Our trainings have been really good, and everyone’s learning from this environment,” Keenan said. Wanganui Collegiate’s Stephen Perofeta has been handed the conductor’s duties at first-five-eight – a sign of Keenan’s faith in the 18-year-old’s ability to control their play. “We’re very proud to have a great mix of experience and new blood. The fact that we have Stephen Perofeta out there alongside Lemi Masoe (North Otago) who’s 35, just goes to show you how fantastic Heartland rugby is, and how guys can keep their bodies going for that long,” he said. New Zealand Heartland plays New Zealand Marist at Trust House Memorial Park, 6pm tomorrow (Saturday) night.